Liz Newman is a Physical Therapist Assistant at the Cantrell Center for Physical Therapy and has been with the Cantrell Center for a year, but did you also know that she’s a newly published author?! Can you tell us a little bit about your inspiration for your poetry book? Liz: The inspiration for “Hope Between Heartbeats” came from immersing myself in the writing community. I often write about personal experiences or emotions, and it has always been a way for me to decompress. Over the past year or so, I have been a professional blogger for several websites and began writing more and more poetry. A writer friend of mine helped guide me through the publishing process where I found a home for my book with CTU Publishing Group. When did your love of poetry start? Liz: I have always loved poetry. I used to write poems and quotes in my agenda books. Writing and literature were always my favorite subjects in school. I had some really great teachers who helped nurture my love for words and they gave me a chance to continue to grow with my own writing. What’s the most exciting thing about being a published author? 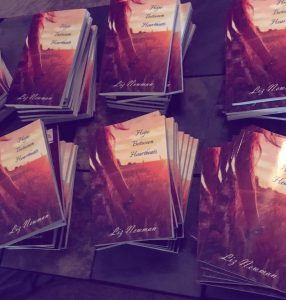 Liz: I think the most exciting thing about being a published author is seeing people interact with my poems and my words. Can you describe to us the feeling of holding the first copy of your book in your hands? Liz: It was a surreal feeling to hold my book in my hands for the first time. It was a dream of mine that I never thought would be a reality, so it was very empowering and humbling to hold my published collection in my hands and see my name on the cover. Liz: The writing process is a little chaotic. There’s no real rhyme or reason to it, but I try and set aside a little time each day to write. Whether it be in my notebook or on my phone or computer, I try and jot something down every day. It’s not always pretty, but it can help the brainstorming process. What do you want the take away to be for readers of “Hope Between Heartbeats”? Liz: I would want the take away for “Hope Between Heartbeats” to be hope. Hope that things will get better even if you’re in dark times. I wrote the book to be divided into four sections: life, love, loss, and learning. They encompass some of our basic human emotions, but they lead back to the underlying message of hope. If someone felt comfort or understanding from reading my words, that would be the best take away for me. How did you choose the name of the book? Liz: I chose “Hope Between Heartbeats” because that’s when we most need to be reminded of our strength and our ability to continue on. Between heartbeats is when life is happening, when our hearts are made full with new love and when they’re breaking and being worn down by dark times. But, our hearts continue to beat and continue to fight. We all need to be reminded of the strength we have within us to endure even the most challenging circumstances. There is hope between heartbeats that life is so much more than the hard times that try and break us. Are you working on other writing projects now? Where can we get a copy of “Hope Between Heartbeats”? You may purchase your copy from Amazon or direct from CTU Publishing Group. 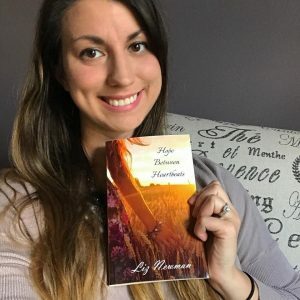 “Hope Between Heartbeats” by [Newman, Liz] – Now Available in the Kindle Edition!